So, Lexi wakes me up this morning with her toy hair brush, (the one she just had to have from the reunion) wrapped nice and tight in her hair. It took me a half hour using the tools pictured below to get it out. She wasn't very happy, to say the least! I was just greatful I didn't have to cut her hair. Spending the afternoon with extended family. Alexis, Oakley, and Eli after shopping at the kids store during the Munro reunion. I know! I know! It's about dang time I added something to this blog! I have never been very good at getting pictures taken of my kids, or updating my blog, or other numerous things, but yesterday I was out shopping (this I am good at) and decided last second to schedule a sitting to have pictures taken of my kids the next day. So, for all you people out there who keep asking me to update my blog. 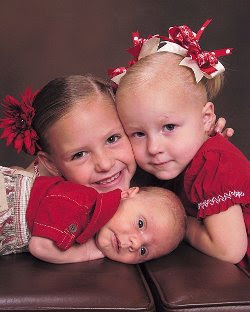 Here is a current picture, at least, of my three children.